Last week brought us the MAC Cosmetics Fabulous Felines collection, and this week we are spotlighting the Chantecaille Tiger in the Wild Palette. 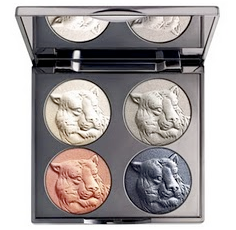 The colorful quad includes three delectable eye shadows and one purrfectly persimmon cheek shade, all laser-etched with the image of a Royal Bengal tiger. And since we also love style with a cause, 5% of the proceeds go to TRAFFIC, the wildlife trade monitoring network that works to ensure that trade in wild plants and animals is not a threat to the conservation of nature.